We were thankful this week to be able to worship and work alongside the Anglican Episcopal Delegation at the 62nd session of the United Nations Commission on the Status of Women. 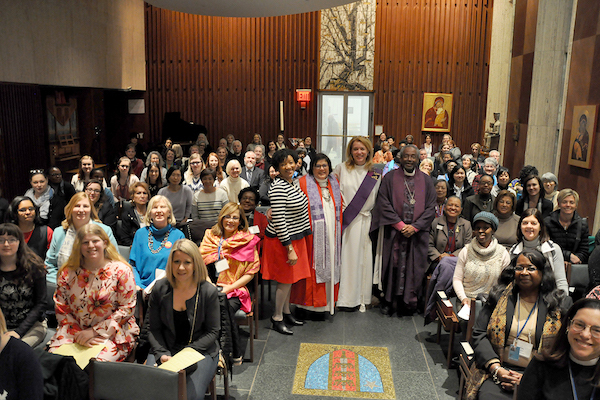 The CSW was established in 1946 to place concerns specific to women at the forefront of the attention of the United Nations, and Anglicans have had a robust presence in this annual work of advocacy. The focusing theme of this session is the empowerment of rural women and girls—persons who face extraordinary challenges in terms of access to water, maternal and infant health care, literacy, and birth registration. They are also persons who experience disproportionate vulnerabilities connected with climate change, war, gender-based violence, economic instability, and food distribution. This year, the 44-person delegation includes members of the Anglican Church of Aotearoa, New Zealand and Polynesia, the Anglican Church of Canada, the Church of the Province of Central Africa, the Church of England, the Province de L'Eglise Anglicane du Congo, the Hong Kong Sheng Kung Hui, the Church of the Province of the Indian Ocean, the Nippon Sei Ko Kai, the Anglican Church of Korea, la Iglesia Anglicana de Mexico, the Scottish Episcopal Church, the Anglican Church of Southern Africa, the Province of the Episcopal Church of Sudan, the Anglican Church of Tanzania, the US-based Episcopal Church, the Church in Wales, and the Church of the Province of West Africa. Seven delegates are from the Mothers' Union; seventeen are Episcopalians from the United States and Venezuela. They are lay and ordained, younger and older, first-time visitors to the United Nations, and long-term veterans of the commission's long lines and long sessions. Everyone comes away with tired feet every day. And his mercy is on them that fear him: throughout all generations. He hath shewed strength with his arm: he hath scattered the proud in the imagination of their hearts. He hath filled the hungry with good things: and the rich he hath sent empty away. This hard work will not reach the Breaking News updates on any of our smartphones, nor shall it find its way into the pre-dawn Twitter salad of Hoban's Folly. But it is the work of the Gospel: the raising of valleys, the preparation of a way in the wilderness, the leveling of rough places, the transformation of what is ruggedness into something better and smooth. The women and men engaged in this work deserve our wholehearted support from near or far, in prayer and funding, in attention and in gratitude.